DISCOVER Spend a free afternoon exploring Regensburg on foot or by bike through its charming streets. Your cruise through Germany begins in Amsterdam with a canal cruise on its iconic waterways. More magnificent views await as you sail to the dynamic city of Cologne—with its signature gothic cathedral and soaring twin steeples. Take a guided tour of the city or choose a walking tour of Cologne’s historical Jewish sites. Take in the peaceful charm of Boppard, sail through the stunning Rhine Gorge to Rüdesheim in the Rhine Valley’s wine country. Join a hike up the vineyard hills with a cable-car ride back down, or enjoy a coffee or wine tasting on board. In Mainz, take a guided excursion to magnificent Heidelberg Castle—and the world’s biggest barrel of wine. Visit a Bavarian Main River Village, then cruise to Würzburg—the “Pearl of the Romantic Road.” Next, visit Kitzingen in Bavaria’s largest wine-producing area to hear the legend of the town’s beginnings. Enjoy a beer tasting on board in the quaint Bavarian town of Volkach. In Bamberg, enter a world where imperial dynasties lived amid the seven hills crowned with churches. Next, take an excursion from Nuremberg to Munich to see the Town Halls of Marienplatz and Nymphenburg Palace—former home of the German monarchs. In Roth, take a tour of Roth’s medieval town, or a guided sightseeing in Nuremberg, or a tour of the notorious Nuremberg Rally Grounds. Visit the Bavarian town of Regensburg, including its fortress entrance built in 179 AD. You’ll cruise to Passau, to visit Germany’s “City of Three Rivers.” In Austria’s lovely Linz, you’ll enjoy a free afternoon to enjoy the sites and sweets in the home of the Linzer Torte. Next, visit the magnificent Benedictine Abbey of Melk, and sail to Vienna—the City of Music. See the Imperial Palace, the world-famous opera house, and St. Stephen’s Cathedral. Arrive in beautiful Budapest for guided sightseeing. 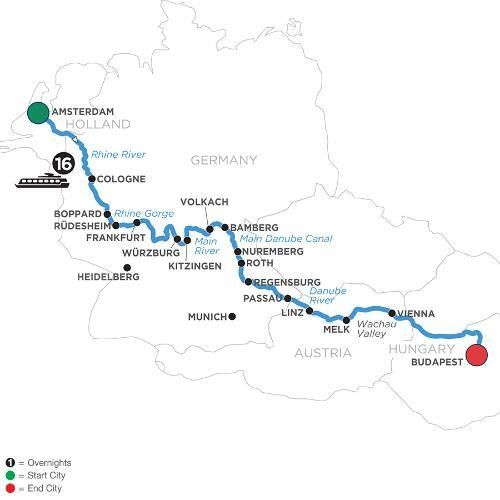 A perfect conclusion to your magnificent European River cruise!